Abstract: This isn't a quiet heatsink in the class of Zalman or Verax, but it is what I think we are going to start calling "lower noise." Built with a body of nickel plated 6063-T5 extruded aluminum and a 2mm thick C1100 copper base, the Coolink U2L is identical in shape to the high-powered U2P varient. Of course in the search for ultimate cooling, manufactures are always looking for the best combination of heatsink and fan, and in this case the U2L is built for quieter cooling. Using an 80mm fan just means that this standard extrusion heatsink works a little better than smaller heatsinks with lower-RPM fans. Sitting above the heatsink fin section is a 25mm thick 80mm 2900RPM fan that produces about 50 dB of noise. This isn't a quiet heatsink in the class of Zalman or Verax, but it is what I think we are going to start calling "lower noise." If Coolink have the equation right, this nickel plated aluminum extrusion heatsink with its' copper base should still be able to offer up some pretty good Athlon cooling. 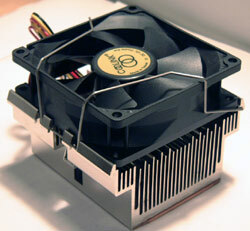 The Fan: YS-Tech make this fan which rotates at just 2900 RPM - making it a quiet cooler compared to the absolutely noisy U2P heatsink. 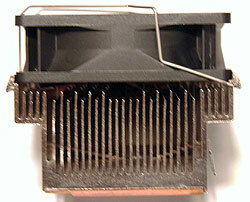 A three-pin connector is used to connect to the motherboard fan header so that RPM signals are still registered by the BIOS. 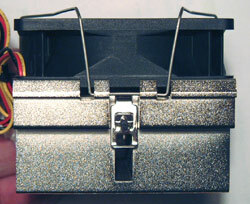 The fan is held in place by a wire bracket specifically designed for 25mm thick fans only. 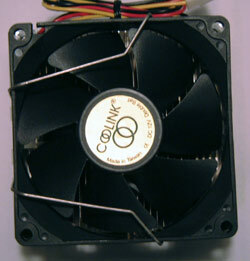 Top: The fin structure of the Coolink U2L is pretty standard as far as extruded heatsinks come. A few fins with no cross cuts, and a single one-tab clip. The aluminum fins are all plated in nickel, and the heights of the tips range by a few millimeters. 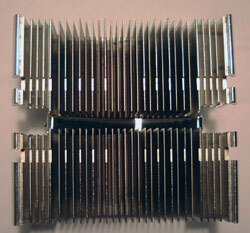 The two surface cuts on either side of the clip are for the wires which hold the fan in place. Side A: The wire clip hooks into the frame of the heatsink to securely hold the large fan in place. Because of this type of mechanism it is not as easy to replace the fan with something smaller, or larger for that matter. The single clip used to hold the Coolink U2L on a Socket A processor is tool based and easy enough to engage. A three prong clip would have been preferred however. The fins vary in height by 3mm at the tips. The fins are 1mm thick and spaced about 2mm apart. Springing up 30mm from the 6mm thick & 3mm thick copper base, the fins are all nickel plated, but smooth surfaced. 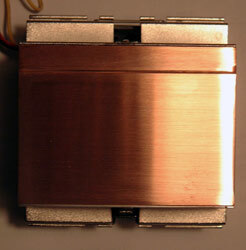 The copper base is soldered to the rest of the heatsink and offers a fairly level and smooth mounting surface. The processor really only needs a small amount of thermal compound to make good contact with the copper surface.